Used Hologic QDR 4500A For Sale. Refurbished, Pre-Owned & Reconditioned Bone Densitometers at Reasonable Prices. Used and Refurbished Radiology Equipment and X-Ray Equipment, Used and Refurbished Diagnostic Imaging Equipment, Used Cath Labs, Used C-Arms, Used MRI Systems, Used CT Scanners, Used PET Scanners, Used Nuclear Medicine Equipment, Used Mammography Equipment, Used Fluroscopy Equipment and Used Cardiology Equipment. 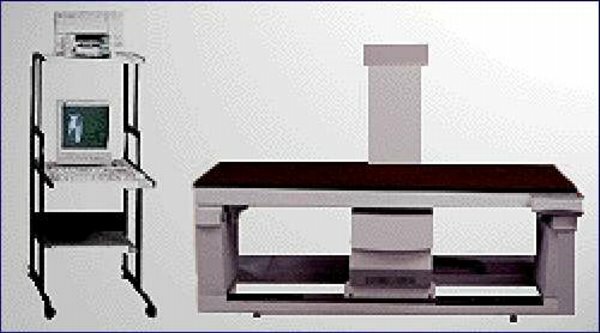 Description: 1995-1996 Hologic 4500A Bone Densitometer Whole Body, Suprine lateral, Ap spine, Left and Right Hip, Femur & Forearm, Pentium Computer, Color Printer,Spine Phantom and Manuals. Completly reconditioned and Upgraded in 2001 Very fast scanning system. Purchase as is where is reconditioned or with warrantry, training & installation. Shipped anywhere in the world.